The South Dakota eviction notice forms are a necessary first step in beginning the eviction process in South Dakota. A tenant must receive properly served notice before a landlord beings eviction action in court. If the tenant does not respond to the notices, the landlord can go to the Local Magistrate or Circuit Court and file a forcible entry and detainer complaint and summons to be served on tenant. The tenant will have four days to respond after service of the Summons and Complaint. If the landlord prevails, the court will issue a Judgment for Possession and the landlord can apply for an Execution of Possession to have the sheriff assist in having the tenant removed from the premises. Rights and Responsibilities – Requirements and laws that both the landlord and tenant must follow. Notice to Quit (Non-Compliance) – If the tenant has violate the lease, for anything other than non-payment, this notice must be sent and to give the tenant “reasonable time” to cure the issue. 3-Day Notice to Quit (Non-Payment) – Tenant has three days after receiving notice from the landlord that he or she is behind on rental payments to pay or leave the premises before landlord can go to court to have the tenant evicted. 30-Day Notice to Quit (Month to Month Tenancy) – This form is used by a party to a month-to-month tenancy to let the other party know of his or her intention not to renew. Rent is due on the date specified in the lease. If the tenant is late, landlord must provide notice and allow three days for tenant to pay what is owed before proceeding. Step 1 – The first step that must be taken before going to court to have a tenant evicted is to provide requisite notice to the tenant that they need to fix a problem, such as not paying rent, or move out and they have three days to do it. Step 2 – If the tenant does not respond, the landlord may then go to the Local Magistrate or Circuit Court representing the area in which the property is located to file a Forcible Entry and Detainer Action. The landlord must fill out a Complaint and Summons and have the tenant served. Step 3 – The tenant will have four (4) days to respond after the Complaint and Summons is served. If tenant fails to respond and/or landlord prevails the court will enter a judgment of possession entitling landlord to possession of the property. Step 4 – If tenant still doesn’t move out, landlord will have to obtain an execution of possession which authorizes the sheriff to force the tenant to leave. 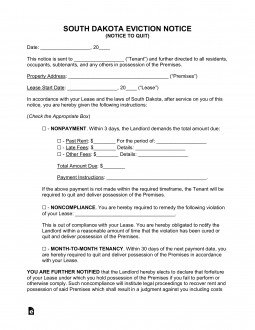 Find and retrieve the Lease the Notice you wish to send concerns itself with. You will also need to download the actual form. This may be done by clicking on one of the buttons below the file image on the right. You may choose to download a PDF, ODT, or Word file as your needs dictate. Find the phrase “City of,” “County of,” “…South Dakota, Zip Code,” “designated by number and street,” and “Apt.” then report the Leased Property’s City, County, Zip Code, Street Address (Building Number/Street), and Apartment Number as reported on the Lease. Find the term “…lease agreement signed on the…” then, fill in the Calendar Day, Month, and Year of the Lease’s Signature Date on the empty spaces provided. This document contains four Notices, one of which must be chosen for Delivery. Choose the one that applies to the situation you are dealing with. Notifying the Tenant of Nonpayment will require the check box labeled “Nonpayment.” Mark this box then supply the required information in the spaces provided. The information supplied must consist of the Name of an Authorized Agent, how much the Tenant owes, how much the Tenant must Pay, and the unpaid Time Period calling for this Payment to be made. Selecting this option means the Tenant will have Three Days to submit the Payment called for to cover the Overdue Time Period. Notifying the Tenant of Noncompliance will require the check box labeled “Noncompliance” to be marked. The Tenant must correct the Lease Term Violation you report on the blank line or allow the Landlord to retake possession immediately. Notifying the Tenant a Month To Month Tenancy will end requires the statement next to the third check box. This document must be received by the Tenant at least Thirty Days prior to the Date you list in this statement. The Tenant will be informed that he or she must leave the premises on the desired Date since the Month To Month Tenancy will cease its effect. Notifying the Landlord a Month To Month Tenancy will end requires the statement next to the fourth check box to be marked. This will inform the Landlord that you seek to end the Month To Month Tenancy you are active in and will terminate the Lease. The Lease will Terminate on the Date you list in this statement so long as the Date is at least Thirty Days’ after the next time the Rent is due. If a Landlord issues this Notice, it must be signed by the Landlord or the Agent just below the paragraph describing this entity’s intent. There will be a Signature line provided for this purpose. The person serving this document to the Recipient will need to also provide a Statement regarding the Delivery. This will be done in the statement below the words “Certificate of Delivery.” Here, the Date this completed form is Delivered and the Name of the person who accepted this Delivery must be entered by the Deliverer. This Notice may be delivered directly to the Recipient, left with an of age individual (i.e. spouse) who may be counted on to deliver this notice, or by First Class Mail (USPS). The Deliverer will indicate which Delivery method applies by checking the appropriate box in this section then Signing his or her Name on the Signature Line.